No matter what age you are, who you are or what you enjoy, Panama City Beach has something for you. World famous fishing, unbeatable scuba diving locations, breathtaking white sand beaches, incredible weather and loads of family friendly amenities are just a few reasons why so many people flock to Panama City Beach to vacation as well as live. The opening of the new Northwest Florida Beaches International Airport has made coming to paradise even easier. Panama City Beach offers 27 miles of stunning award winning beaches, amusement parks, shopping and restaurants that will make you never want to cook another meal. Two state parks book-end Panama City Beach; St. Andrews State Park and Camp Helen State Park, together these two parks offer the nature lover almost 1500 acres of hiking, camping, beaches, kayaking, canoeing, and so much more. 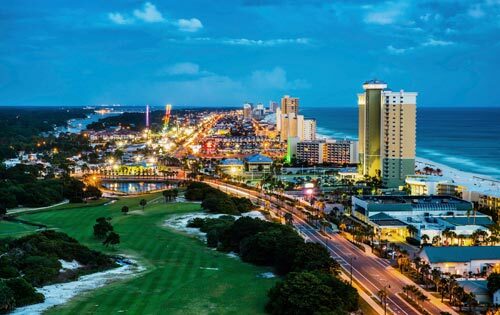 For the golfer in the family, Golf Digest magazine named Panama City Beach as one of the top three golf towns in America. With several courses within minutes from the beach and the mild temperatures all year long, Panama City Beach is prime for tee time! CNN.com’s Money Magazine hails Panama City Beach as the top city for the fastest growth in the nation. Changes are happening daily in this city with just 12,000 year-round residents. The Bay County school district has previously been ranked in the top 25% of all public school districts in Florida. There are also two colleges also reside in Bay County--Gulf Coast State College and Florida State University-Panama City. Gulf Coast Medical and Bay Medical along with numerous clinics and specialists provide excellent healthcare to residents and visitors and offers peace of mind that help is close by. Real estate in Panama City Beach is making a strong recovery. Golf communities, beachfront homes and condos, patio homes, and gated residential communities offer something for every facet of life. Investment properties with rental income create opportunities for cash flow and tax breaks while allowing you to have a home away from home at the beach. With reasonable prices and excellent rental income potential, Panama City Beach has become the place to buy!